Netiwit Chotipatpaisal became the face of student human rights campaigning in Thai schools after receiving nationwide attention for successfully advocating an end to compulsory student haircuts. He and his friends usually organise forums, meditations and film screenings regarding the debate about education, whose ideal purpose, he thinks, is the liberation of humankind. But in the turbulent political situation of recent weeks, the 17-year-old founder of “the revolutionary education front,” became a little more politically involved outside school. He said education and politics in Thailand are intertwined and reflections of each other. 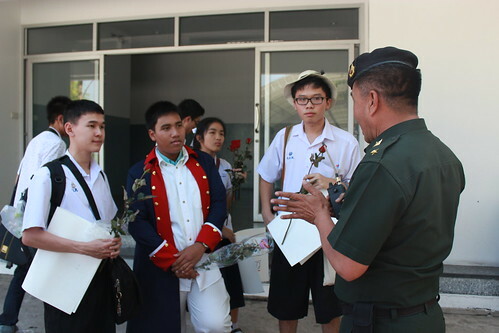 “The situation is so sensitive that even the generals have to be wary of us,” said Vichakrith Jewajinda, a M.5 student from Triam Udom Suksa School who joined the activity. This occurred when rumours of a coup are widespread. When asked, the nation’s army chief did not deny the possibility of a military putsch to intervene in the political unrest which has been stirred by the conservative, anti-government protests that have occupied parts of Bangkok for the past two months, with the ultimate goal of getting rid of the “Thaksin regime,” referring to the “clan” of former Prime Minister Thaksin Shinawatra. But it’s not only army generals who are extra cautious of Netiwit, so is a school Director and a former Rector. Last week, Netiwit headed to a school in Ubon Ratchathani Province in Thailand’s northeast region at the invitation of the school’s Law Club, to learn that the event where he was an invited speaker was cancelled under political pressure. The student organizer said that the school Director had received complaints from a group of concerned parents who believed Netiwit was a troublemaker possessing a “dangerous mind” against the monarchy, and advised against having him at the school. 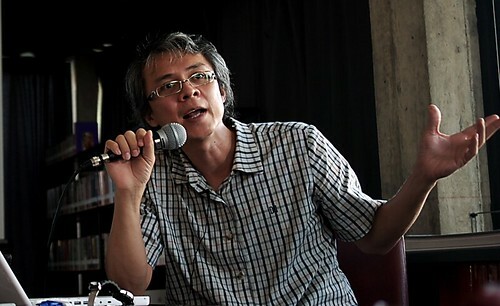 Sompong Charoensri, the student club advisor, said the Director requested that the event be cancelled since he had received threats from anti-government protesters, and a special request from a former Rector of Ubon Ratchathani University who is also the head of anti-government protests in the province. “Thai society should not be this polarizing, to the point that they need to shut us down. Educational institutions should be a place where you can explore any ideas,” said Netiwit. The club eventually had to move the venue to the Provincial Police Headquarters, where the father of one of the organizers is Superintendent. There Netiwit got to discuss human rights, his fight in school, as well as the 2014 general election with about ten students who followed him from the school, out of about 200 students who had expressed an interest. Netiwit’s stories shed some light on certain characteristics of Thai politics; the competing forces of the conservative establishment and the more liberal side challenging it for political equality. Political conflict in Thailand has become more polarized in recent years and educational institutions are not immune from it. In recent months, the stance of Thai universities become the most obvious since the 2005 political unrest. That led to the 2006 coup, which ousted Thaksin, who is now in self-exile. Amidst the ongoing political unrest which has already claimed at least 8 lives, the Council of University Presidents, a network of 13 university heads, has recently called on the Yingluck government to resign, postpone the election, and set up a national government, a proposal deemed by many as siding with the anti-government protesters. The proposal came after Somkid Lertpaitoon, the network’s President and Rector of Thammasat University, suggested in December that all universities should close down, citing safety reasons, when Suthep Thaugsuban was calling for a nationwide strike. This would not have prompted the opposition and condemnation from over 100 academics for his politically-biased proposals, if Somkid’s history were not known of serving the military junta in writing the controversial 2007 Constitution. Somkid, however, is not the only university president who has cooperated with the illegitimate government. 17 university rectors became members of the National Legislative Assembly in 2007; the ad hoc legislature that was handpicked and set up by the junta shortly after the coup. Many of those are still rectors of their universities today. Yukti said many rituals in the Thai education system were symbolically linked to the royal institution, whether the graduation ceremony, endorsement of academic positions and even the names of universities and colleges that mostly have royal names, which illustrate the patronage system. Yukti Mukdavijit, Anthropology Lecturer from Thammasat University. Aside from the rectors and executives who were obviously supportive of the 2006 coup, many pro-establishment and conservative intellectuals like elder statesman Prawase Wasi sit on the councils of six leading universities, such as Chulalongkorn, Thammasat, Mahidol and Rangsit. “It is doubtful that he would have enough time to contribute fairly to all those universities,” said Yukti, adding that these are ways to control the political and ideological agenda of society through the direction of knowledge and research. Often labelled as being “red,” the colour identified with Thaksin supporters, from his studies of the red shirts and his liberal point of view, Yukti said this has cost him many missed academic opportunities, often resulting from politically motivated decisions. He said last year he was nominated for an executive position at a national research institution which he cannot name. But he learned that he was rejected by the board due to the perceived politically-coded “colour of his shirt,” while funding for the thesis one of the Master’s students he supervised was rejected because it dealt with the lèse majesté law.